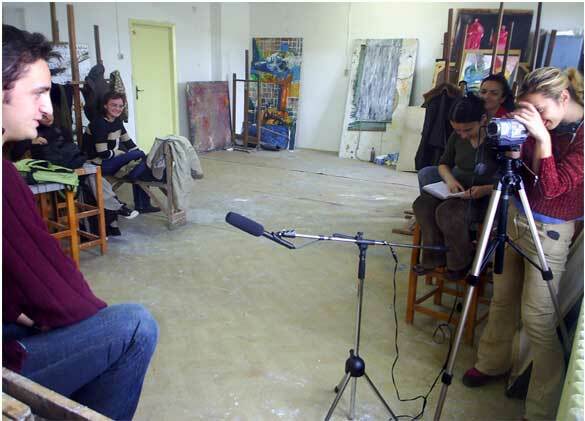 In July 2005, during our residency at Iaspis, in Stockholm, we interviewed artists there and collected their answers to the question "How did you decide to become an artist?" This project that we did in Stockholm, in a context that is so different from ours, had its starting point and its motivation closely linked to the circumstances in Romania, linked to the fact that it is so difficult to construct our identity as artists, linked to our work at h.arta space (work which is about this need to find a possible “definition” to our situation as artists in Romania, need to understand our context and react in a constructive way to it). In October 2005 we had a presentation at Vector gallery in Iasi, where we talk about our work at h.arta space and where we proposed to the interested art students to participate in the project How did you decide to become an artist?. The next days, during a week, we have met these students in different places, which they chose, in coffee shops, in parks, in their studios, and we interviewed them. There were 13 students participating (Alexandra Andriescu, Madalina Bancila, Lavinia German, Alexandru Grigoras, Ioan Ene, Andreea Nasoi, Oana Nicuta, Eugen Pop, Bianca Simionescu, Adrian Stoleriu, Mihaela Stirbu, Oana Toderica, Bogdan Vatavu) and we discussed about the art education system, about our expectations as artists, about the ways art and artists are seen in the society, about the things that our parents and teachers told us about art, about the stereotypes associated with art, about how we see our future as artists. We edited their very interesting, useful and sincere answers in a text named How did you decide to becomean artist? - a story in seven chapters. This text, published in the Iasi newspaper “Suplimentul de cultura” and as insert in “IDEA arts+society” magazine was part of our contribution at Periferic 7, section Social Processes, curated by Marius Babias and Angelika Nollert. Read the text How did you decide to becomean artist? - a story in seven chapters, in Romanian, here.